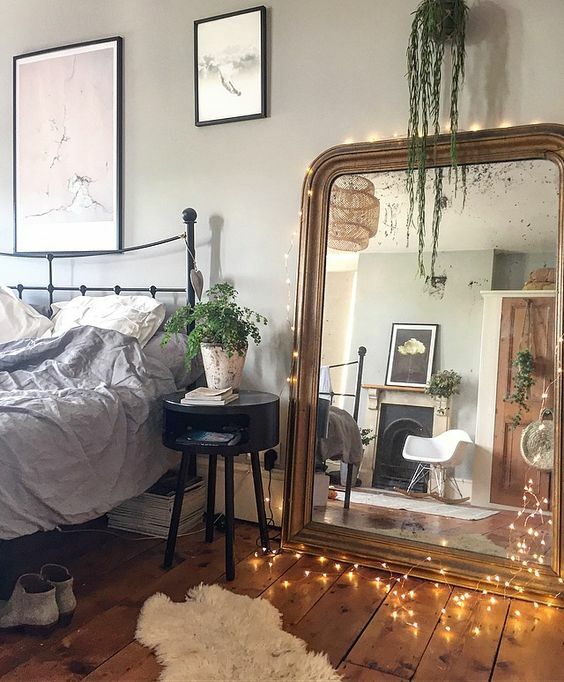 Modern Boho Master Bedroom Makeover: modern neutral boho bedroom makeover with lots of texture, a mix of modern and traditional, some DIY touches, gallery wall, and lots of plants. It’s that time of year again, time to take on one room of my home and make over in six weeks, with weekly updates here. 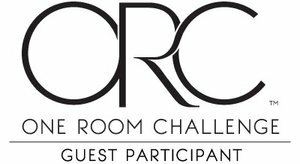 I’m excited to be a guest participant again in the Spring One Room Challenge. 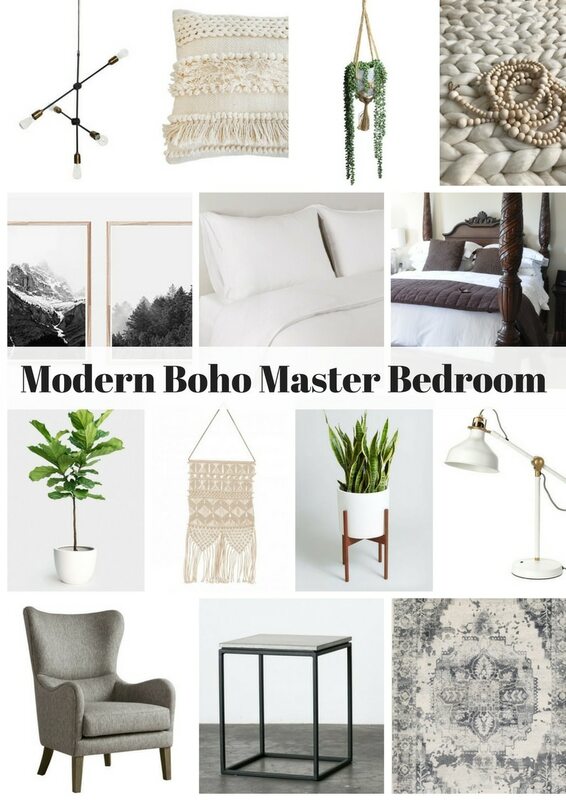 This time I’m taking on my Master Bedroom and transforming it into a Modern Boho Master Bedroom. You might remember last time we did our Kitchen, and I love it so much now -see the reveal post here. The time before that we did our living room and eating area -see the reveal here. And the first time we did the ORC we did our dining room -see the reveal here. We bought our house about 12 years ago now, and at the time we painted our bedroom a nice warm beige. Our bedroom furniture was one of our first married couple purchases 17 years ago. My husband LOVES it. It’s a little traditional for my taste, but was part of a compromise at the time -I got to pick the living room furniture and he got to pick the bedroom furniture. His love for it hasn’t faded, so it has to stay. I did convince him to let me replace the bedside tables for something more modern -although we’ll really miss the storage. 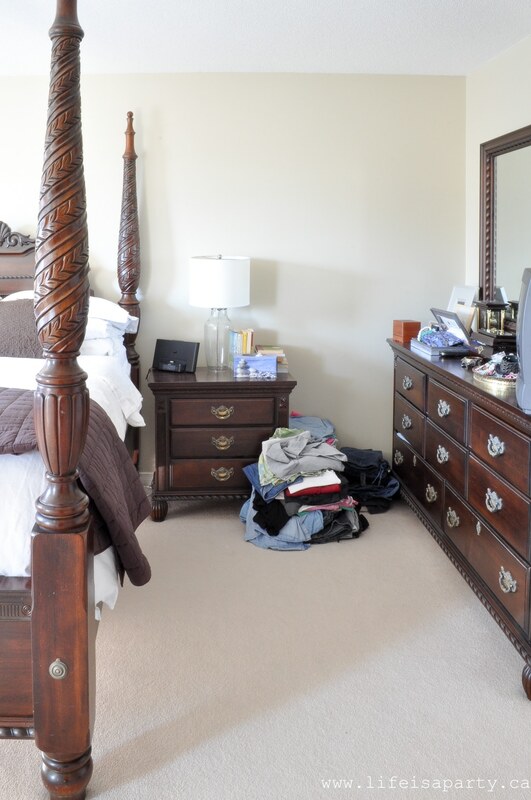 Speaking of storage…all those clothes on the floor are mine. There’s a mix of seasons and sizes. It’s definitely past due time for a purge and to get organized so that will be part of my makeover agenda this time as well. We’ll get rid of this old tv too. It was great when my girls were little and they’d crawl in bed with me in the early morning, or someone was sick. But now a days everyone watches tv on their laptops so there’s no need for it. Over here on the other side, I’m hoping to add some nice large plants by the window. 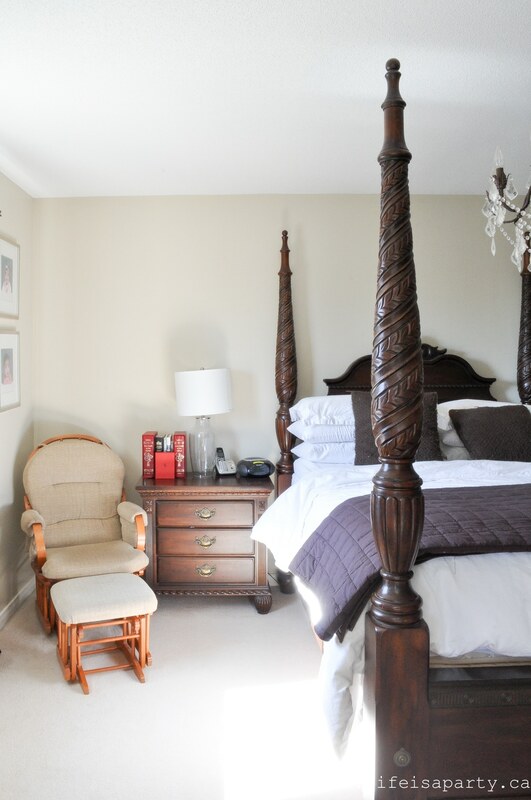 And the chair will be replaced too and relocated to the slanting wall at the end of the bed, I think. The gliding rocker was nice for a nursing momma years and years ago, but it’s sure lacking in style. I’m also hoping to do some fun art work in the room and a gallery wall on one of the walls. The room will be painted a nice crisp white, and the light carpet and white bedding and new white curtains should add an airy feel. Here’s my mood board, to give you an idea where I’m headed. I’m continuing with the Scandinavian feel that I’ve been using on the main floor. 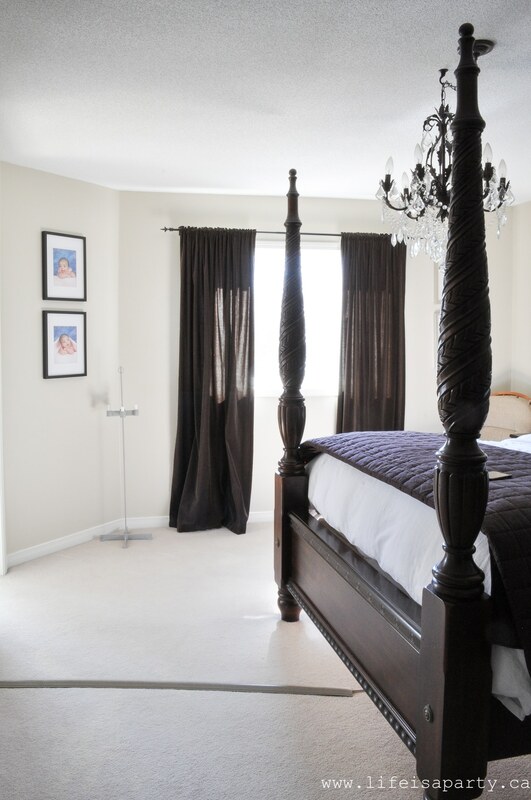 This room though will showcase the traditional bed juxtaposed to modern pieces. It won’t be quite so minimalist. I’m hoping for a Modern Boho Master Bedroom feel to the room, with lots of black and white. I hope it will have a collected European vibe when I’m all done. It’s definitely challenging to work around an old piece, especially when it’s the centre piece of the room. Maybe some of you can relate, and have to work around existing furniture too? I’m hoping that by contrasting the traditional bed with really modern pieces that the bed will feel show cased in the room. I’m taking some inspiration from one of my favourite instagramers here -Dee Camping. Her room is very different from mine, but I’m inspired by the real mix of old and new, all the plants, and the simplicity of the room. I’m missing the old floor boards, and the qusint English setting, but I shall do my best. Think I can get there? If you’d like to see more of my inspiration, check out my Modern Boho Bedroom Pinterest board. I’m so excited to get started and fall in love with this room again. Is your bedroom kind of a neglected space too? Hopefully a few new pieces can really make it feel special again. Be sure to follow along with all the amazing One Room Challenge makeovers. Last time there were over 200 guests participants and tons of inspiration! Be sure to check out the other rooms here. With a new Modern Boho Master Bedroom Makeover, life really is a party! Home Depot, Wayfair, HomeSense, Afloral, Amara, Para, Minted, Bobbie Made, Benjamin Wood Works, and Auto Artwork Shop. All opinions are my own, as always. Thanks for supporting the brands that make Life is a Party possible. your mood board looks amazing! excited to see this space. I love all of the different textures you’re planning to use! Can’t wait to see the finished product! 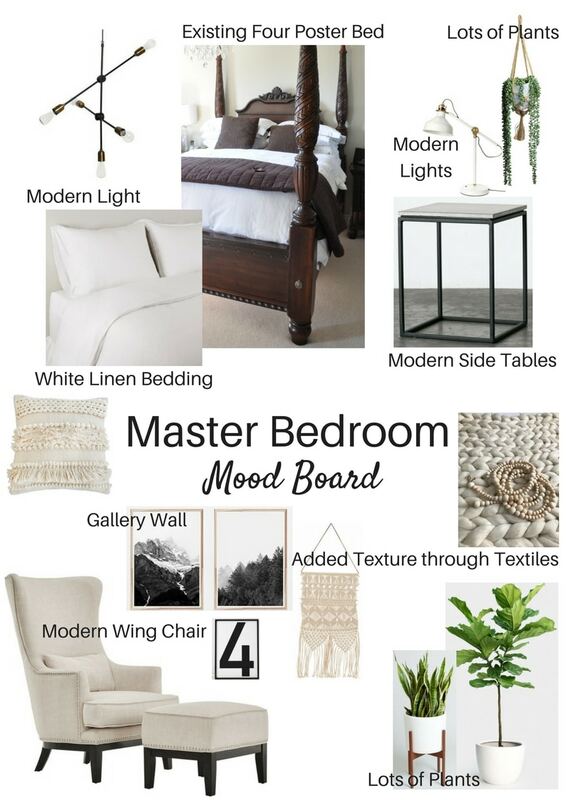 I love the Boho vibe in your mood board. 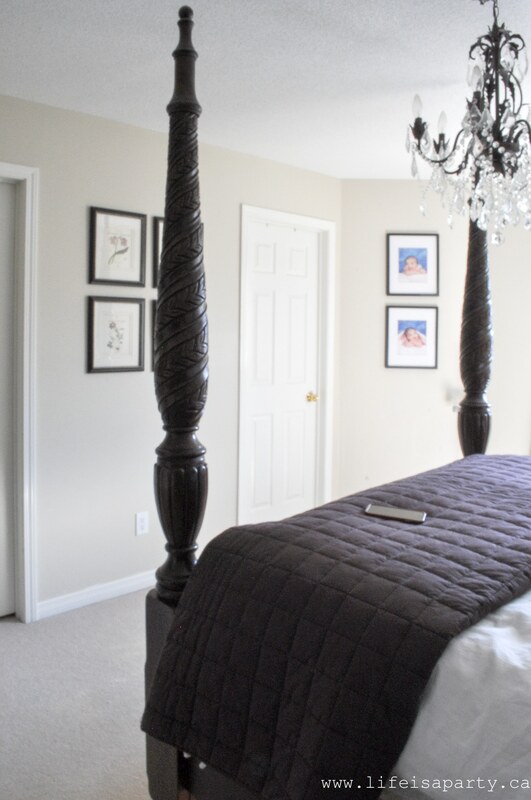 Master bedroom makeovers are so much fun to do. Totally worth it when you walk into your room each day. Can’t wait to follow along! I’m so excited to see where this room turns out! I love your ideas! I can’t wait to see this room! I too have a four poster bed that I don’t want to part with. I think it looks like a solid plan to incorporate it in beautifully. Dannyelle my husband would love that bed! It took me 9 years to get him to give up the bed he had when we moved in together. I think yours will look great mixed with a boho vibe and I can’t wait to see it!!! I love a mix of traditional and modern pieces. And what is it with husband being attached to the things we hate? I wish you luck, friend! 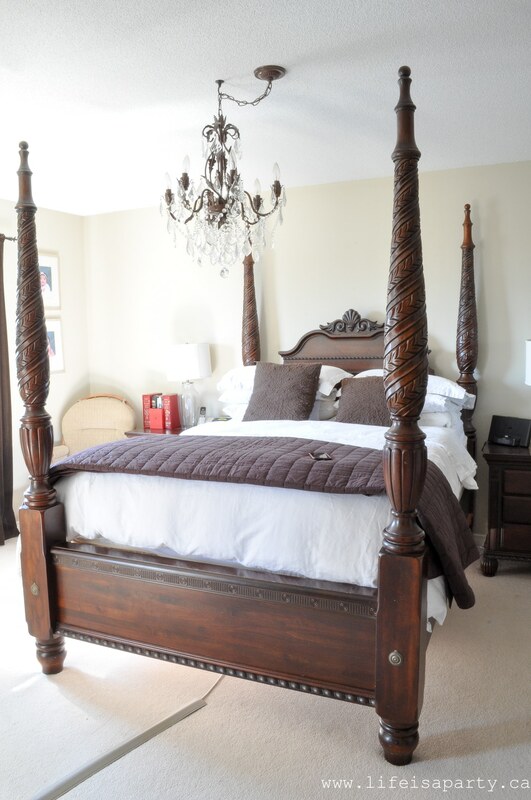 I love four poster beds! I think this is going to be a great transformation! Can’t wait to watch! Thanks Susie, here we go indeed! Kate thanks so much. Let’s hope all the texture keeps this neutral room interesting. Thanks for stopping by. Tee, thanks for the encouragement. I love the idea of walking in and loving the room, instead of being a bit forgotten. Thanks Linda. Seems laptops have replaced lots of our old TVs. Time for a change for sure. Thanks Ruthie, so glad you’re following along. Susanne, thanks so much. The really funny thing is that he wanted a King, but I convinced a Queen was loads big. 17 years later and I so regret it, and he reminds me, haha. Hopefully we can make the old bed shine in the new plan. Love love love the new design! Can’t wait to see how it all comes together. Looks like pure serenity. Joy thanks so much. I hope it turns out to pure serenity! Dannyelle I so feel you, sister!!!!! This looks eerily like our bedroom 7 or 8 years ago complete with the glider in the corner! I compromised with my husband too and kept our heavy wood furniture, but it’s truly amazing how a fresh paint color on the walls, plus mixing up the rest of the furniture in the room can completely transform a space. I am so glad we kept our dark wood bureaus now, they work so beautifully in the space and I think your plans are going to make that dark wood pop and give the white such a gorgeous contrast! Looking forward to seeing more through the weeks! Can’t wait to see this space! 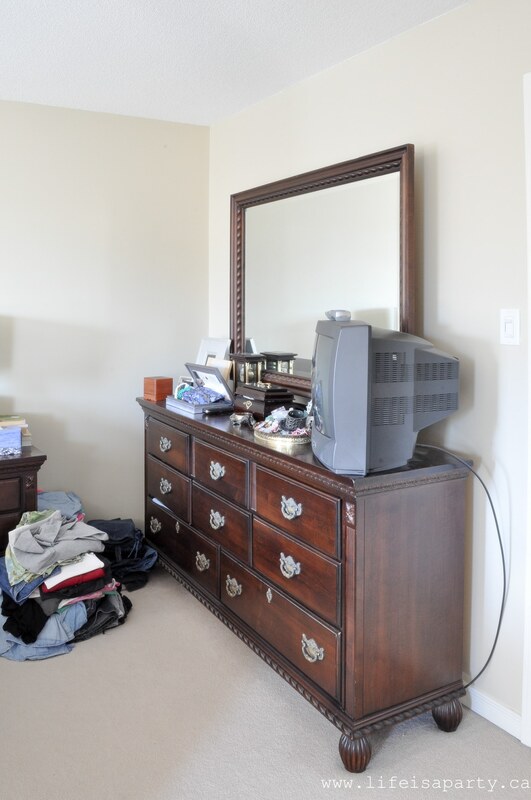 I’m doing our master bedroom too, and am struggling with the furniture choices we made 10 years ago when we got married….my husband doesn’t want to get rid of them! Looking forward to following along! love that you are mixing in the creamy neutrals to balance off the wood tone … that modern wingback nails it! Lisa, thanks so much for your sweet encouragement. I sometimes find to plan it all out when it’s just in my head and it feels like there’s so many moving parts, so I really appreciate your kind words. Hi Jude, guess we’re in both in the same boat, here’s hoping we get there in the end. 😉 Thanks for the encouragement. Thanks so much Tim, I love your style so much and so appreciate your encouragement! I love your plans for your room! I can’t wait to follow along! Jenny, thanks so much for following along with me. Can’t wait to see how it comes together, Dannyelle! I’m sure many of us can relate with incorporating existing furniture pieces into a new design. I’m sure it’ll be a real oasis when it’s done! Such a pretty plan! I love boho style. Excited to see it all come together! I think you’ve got a solid plan Dannyelle. Excited to see how you tie together the traditional bed with all the modern accents. I think it’s going to work perfectly! Good luck. We’ll be following along. Thanks so much Sonja, and thanks for following along! Jessica, thanks so much. Everyone could use a little boho, right? Tash, thanks so much, and for following along. Best of luck with yours too!